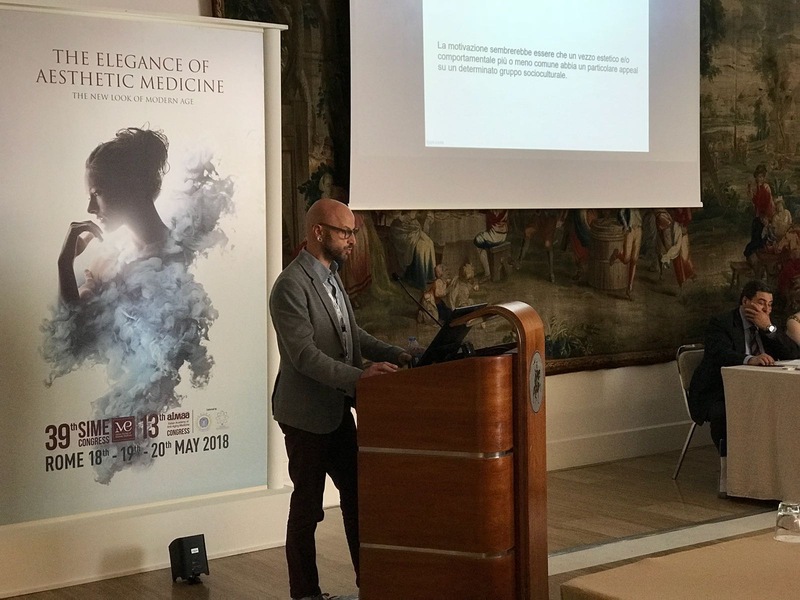 For the third consecutive year, APTPI Association was asked to give its opinion at the International Congress of Aestethic Medicine, now in its 13th edition, held every year in Rome. In an extremely official setting, relevance and authority, Bruno Valsecchi ed Emiliano Marchetti have prepared a presentation on the given theme “The elegant tattoo (and piercing)”: in other words, when our world meets elegance. The theme, in my opinion, immediately appeared empty and without any interest; even slightly out of context. Preparing the speech, however, interesting thoughts were born, and we shared them with the usual audience of researchers, doctors and other scientists. Both Bruno and Emiliano have emphasized how relative and heterogeneous the concept of elegance is, considering the multiplicity of cultures that have developed on our planet. For some of these it was interesting the excursus on the ornamental practices of piercing proposed by Bruno, who showed photos with ornaments and techniques typical of various cultures. Particularly interesting during the report of the Association’s President was when he illustrated the elegance in the execution of a professional piercing, highlighting equipment, procedures and gestures: for a professional, or even for a passionate expert, to see them was a true pleasure. Difficult to read this pleasure even in the eyes of doctors in the room … but by now we are used to it! Emiliano’s speech was instead focused on a philosophical / professional aspect. Reiterating the concept of “relativity of elegance” expressed by Bruno, he focused on the professional duty of the tattoo artist to be the first “expert of beauty”. Nourishing one’s inner self through the practice of art would make the tattoo artist an important reference for the customer, who would have at his disposal an authoritative guide to an intense and original result, that would be difficult to regret. The dermatologist, purple face, has defended himself saying that there is no scientific literature that can show how a tumor in the lymphatic system may have been caused by the crushed pigment. The answer was the same, but many of those present at the debate were happy that we had asked the question. All but one! However, on the initial theme, only we have exposed our opinion; for the rest, it was interesting to know the new technologies dedicated to the control and safety of our materials and the very recent research that shows how there is still a long way to go to make our work totally safe. What is already certain is that tattoos and piercings should be performed only by trained and experienced operators and that their duty is to continually update their skills to offer an excellent service from every point of view.